Churches are In An alphabetical order by location. Check church link for more up to date information. Alexandria-Cornwall Parish Index with addresses, time of Masses, etc. Also at the Diocesean Centre, or basement of Nativity Church on Montreal Road, Cornwall, Ontario all church records, Baptisms, Marriages, Deaths are on microfilm for all the Catholic Churches within the Diocese of Alexandria-Cornwall and I believe available for public viewing until about 1920, probably by Appointment only, I believe. Located at 325 Toll Gate Road East. Located at the corner of Marlborough and 506 1st Street East. 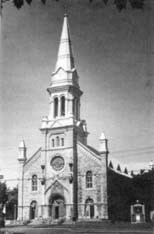 Both the St. Columban's Church and the Rectory were designated as Heritage building under the Heritage act By the City of Cornwall. Third Church completed in 1897." With Same inscription in French. St. Columban's Rectory completed 1875 " With Same inscription in French. Located 105 2nd Street West between Augustus and York. Located at 17446 Sandringham Road.